Issue #40 of Weekly Shonen Jump marks the 15th and final chapter of Shonen Shikku, the first major work by newcomer Tsukuda Yuuto. Since becoming eligible for fan ranking, Shonen Shikku has never managed to escape the bottom 5 of the table of contents, even placing dead last five times. Its early cancellation is yet another in a string of poor performances from new Shonen Jump series, as has been evidenced by the similarly early ends to Lock On! and Kiben Gakuha, Yotsuya-senpai no Kaidan, and as it seems will further be proven with another cancellation expected next week. Beelzebub is set to receive an anime adaptation this coming January. The first major work by Tamura Ryuuhei, it has been running in Weekly Shonen Jump since February 2009. Beelzebub is a fusion between fierce action and excellent comedy, along with notable supernatural elements, as the story follows Oga Tatsumi, a renowned delinquent who is saddled with the task of looking after Baby Beel, the son of the demon king. The series features a diverse cast of characters, including the loyal servants of Baby Beel, Oga’s rival delinquents, and one of the absolute best comedic straight men in all of manga. The announcement of an upcoming anime for Beelzebub is both exciting and surprising. While the most recent manga arc has been a minor disappointment, the rest of the series has been a fantastic weekly read, and welcome diversity in the pages of Shonen Jump. However, as of this writing, the series only has 74 chapters, meaning this seems to be rather soon for an adaptation. Four months give more than enough time for the current manga arc to finish, but even with those extra chapters, the worry is that the anime studio would not have enough source material, leading either to questionable pacing or filler episodes. Another Shonen Jump series, Nurarihyon no Mago, had a similar number of chapters when its anime adaptation was announced, and that anime (which is currently airing) has yet to show signs of having insufficient source material; on the other hand, the Nurarihyon no Mago universe has more intricate detail that can be explored by its anime studio, meaning that the current quality of that adaptation may not equate to similar success for Beelzebub. Regardless of speculation, news of a good manga series receiving an anime is always positive, and a Beelzebub anime should be well worth watching. Early internet reports indicate that the final chapter of Lock On! 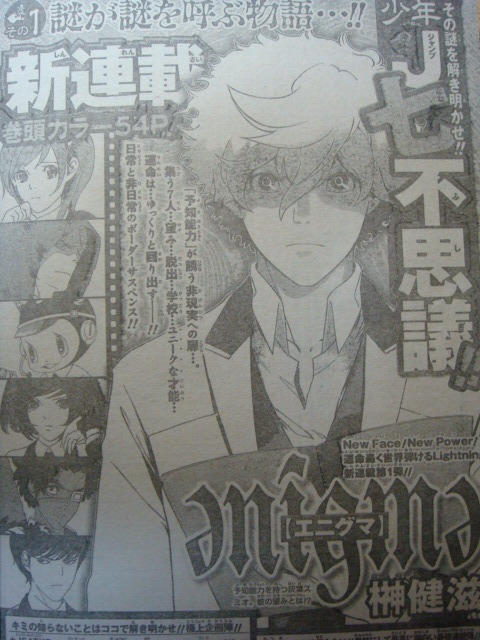 will run in Issue 30 of Weekly Shonen Jump, which hits store shelves in Japan on June 28. Lock On!, the first major series by newcomer mangaka Tsuchida Kenta, never strongly established itself within Jump, but fans of the series could be justified in crying foul over its cancellation prior to Kiben Gakuha, Yotsuya-senpai no Kaidan, another Jump series which debuted a week after Lock On!. Since both series became eligible for fan-voted rankings, Yotsuya has ranked below Lock On! in every week except for two, one of those being the upcoming issue in which Lock On! publishes its last chapter. Yotsuya itself is still far from safe, and could very well be canceled the week after Lock On! ends publication; this depends on whether the Jump editors will treat Hunter x Hunter (again on hiatus) as the other title to move aside in favor of new series. If the editors don’t regard HxH as such, another series would need to be cut to make room for the two debutants, and that series would likely be Yotsuya. The two new series that will grace Jump are SWOT and Oumagadoki Doubutsuen, both of which received one-shots in Jump in 2009. SWOT, by Sugita Naoya, is a hybrid delinquent / romantic comedy series about a “swot” (defined as a person who spends too much time studying) with lofty ambitions who transfers into a once-prestigious school that has been overrun with delinquents. Soon, he meets a weak boy and a legendary delinquent girl, the latter of which causes him to experience unfamiliar feelings. The other series, Oumagadoki Doubutsuen (“Oumagadoki Zoo”) by Horikoshi Kouhei, is about a clumsy, animal-loving high school girl who applies to work at a nearby zoo which turns out to have a decidedly bizarre secret. Oricon has released their figures for manga sales in Japan for the first half of 2010. The most notable series on the list is One Piece, which not only outsold the next best-selling series (Naruto) by a ludicrous amount, but within a half-year has already outsold its entire previous year’s worth of sales (14,721,241). Weekly Shonen Jump dominates the list, with the only shonen competition coming from Fairy Tail, which has seen a surge in sales thanks to its anime, and Fullmetal Alchemist. Bakuman is the most surprising entrant in this list; having sold this many copies with only eight volumes available to date, and with an anime adaptation coming this fall, it’s a series on the rise. Weekly Shonen Jump again controls the list, with 48% of the top 25. Of the top 25, 18 are shonen releases, and 12 of those (67%) are Shonen Jump titles. Surprisingly, despite Fairy Tail placing in the Top 10 Series chart for the same time period, no volumes of Fairy Tail or any other Shonen Magazine series placed in this list, while only one Shonen Sunday release did (Detective Conan 67). Categories: Articles, Weekly Shonen Jump, Weekly Shonen Magazine, Weekly Shonen Sunday Tags: Bakuman, Black Butler, Bleach, D.Gray-man, Detective Conan, Fairy Tail, Fullmetal Alchemist, Gintama, Hunter x Hunter, Katekyo Hitman Reborn, Kimi ni Todoke, Naruto, Neon Genesis Evangelion, Nodame Cantabile, One Piece, Ookiku Furikubatte, Real, Vagabond, Yotsuba&! News in Issue #26 of Weekly Shonen Jump indicates that Togashi Yoshihiro’s Hunter x Hunter will once again be going on indefinite hiatus beginning in the following issue. This news is not surprising to any longtime fans of the series, as Togashi has frequently taken breaks for unconfirmed reasons. Rumors abound as to the reasons for so much time off, ranging from a serious medical condition to personal issues regarding the merchandising of his works to an overwhelming, life-ruling love for the Dragon Quest series of video games. These rumors are all speculation (well, except for his love of DQ), so it’s difficult to formulate an opinion of Togashi as a mangaka. Is he lazy for taking so much time off? Is he brave for drawing as much as he can while his health allows him? Is he foolish for not expecting Shueisha to capitalize on the popularity of his series, given that he previously wrote the successful YuYu Hakusho? Regardless of the reasons for his absences, Hunter x Hunter and its fans have suffered. 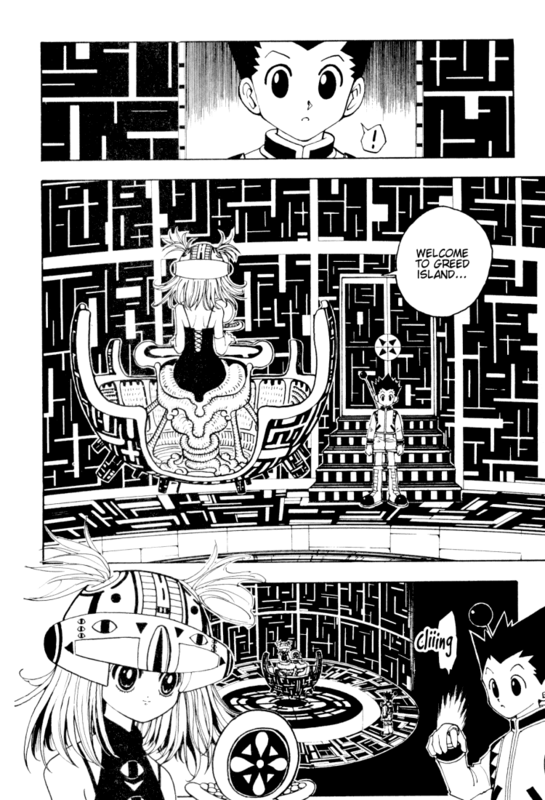 This most recent run of HxH began this year, in Issue 5-6 (double issue), 2010, with chapter 291. Issue 26 contains chapter 310, the last chapter before the new hiatus. In that span of 20 chapters, we’ve seen two major, conclusive fights (Netero vs. the King, Gon vs. Pitou), two minor fights (Killua vs. Palm, Ikarugo vs. Werefin), one huge plot point (Kaito), some other minor / inconclusive action (various people vs. Pouf, King vs. Melereon & Knuckle, the “game”), and whatever the hell chapter 299 was. This run for HxH has actually been one of the better ones. 20 chapters is enough for two volumes, an improvement from Togashi’s recent tendency to release one volume’s worth at a time. Also, the amount of action and plot advancement in those 20 chapters would be considered good for most shonen series, and is laudable when compared to other HxH runs, but this Chimera Ant arc began way back at the end of chapter 185. 125 chapters in WSJ without breaks would span over two and a half years, and would clearly be considered a long arc for any series. In terms of publishing schedule, though, Hunter x Hunter isn’t just any series; chapter 185 ran in Issue 28, 2003. Seven years ago. This arc has continued for seven years, but without the satisfaction of actually progressing through plot along the way. That, combined with the fact that some of the characters who helped the series reach its peak in popularity (Kurapica, Hisoka) aren’t even in this arc, makes for a frustrated audience. Clearly, at his best, Togashi is a talented artist, and to his credit, he cleans up his work and creates proper art for volume releases. 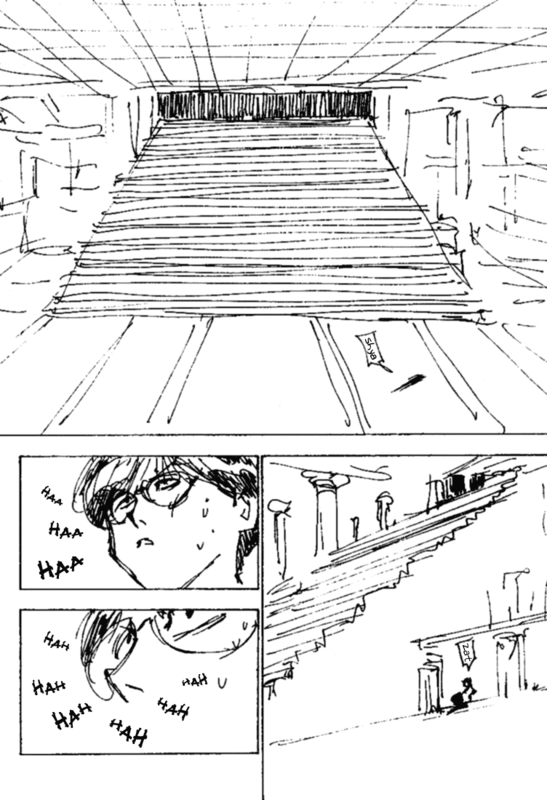 That said, sketches like this, for which he has become infamous, are unacceptable for a series in a major shonen magazine, let alone one by an established mangaka. From its debut (Issue 14, 1998) to present day (Issue 26, 2010), Hunter x Hunter has been absent from Weekly Shonen Jump 276 times. The longest hiatus was 79 straight missed issues (2006-2007). The series was absent the most in 2009, missing 46 of 48 issues that year. There have been 585 issues of Weekly Shonen Jump since HxH began; Togashi has missed over 47% of them. Given 48 issues of Jump in one calendar year, that’s 5.75 publishing years missed. By comparison, One Piece (debut: Issue 34, 1997) has missed 33 issues to date. Naruto (debut: Issue 43, 1999) has missed 19 issues to date. Amazingly, KochiKame, which began in Issue 42, 1976, has never missed a single week! Of course, most of these figures will be obsolete beginning in a couple weeks, as yet another hiatus begins. The future of the series remains worrisome, not in terms of publication (Shueisha is unlikely to choose now to cancel the series, over any other opportunities it has had to do so) but in terms of the story. For all these shortcomings and legitimate issues, Togashi remains a creative and engaging author who devises fascinating stories, clever powers and fighting styles, and interesting characters. His biggest failing is an inability to see his ideas through to an acceptable conclusion, as was evidenced by the end of YuYu Hakusho, and as has been unfolding before us for years now with Hunter x Hunter. Feeling appropriately frustrated, some fans have called for the series to end with the climax of this arc, but that would be a disservice both to those who have stuck with the series through all the delays and scribble-art, and to Togashi’s own unresolved plot. Other fans clamor for Togashi to hand artistic duties over to another mangaka and concentrate on the writing, which Togashi surely is unwilling to do, or it would have happened years ago. In any case, Hunter x Hunter deserves a proper finale beyond this arc. Will Gon ever find his dad? Will Kurapica ever achieve the full extent of his revenge? Will Leorio ever… matter? This series is too good to die without suitable resolution for its most important storylines, but whether said resolution is acceptable or otherwise, it seems we’ll be waiting quite some time before we get there.